More practical guidelines for digestive enzymes. Karen DeFelice follows up her two previous works on the subject of enzymes with this book, a look at enzyme therapy which updates the reader on the latest developments in the field and makes the information practical for everyday use. Enzyme therapy is one of the fastest emerging successful alternatives for digestive health. Reports of significant improvements in health, immune function, pain reduction, even moods, mental clarity, food and chemical tolerances, and gastrointestinal issues emerge daily. 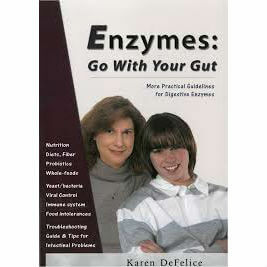 Drawing on long-standing scientific research and trials by a wide range of families, Karen DeFelice deals comprehensively with all the information on digestive enzymes that those new to enzymes need: how enzymes work, why the many benefits, what to expect, practical tested advice on selecting and introducing the right kind of enzymes, and how this can be combined with other approaches, therapies, and lifestyles. Bli först med att recensera “Enzymes – Go with your gut” Click here to cancel reply.